One of my wife's favorite things was for me to barbecue something on the grill for dinner. But after a surgery to correct a gastro-intestinal problem she began to notice that certain foods were a problem for her to digest. She isolated two of the culprits: onions and anything in the bell pepper family. That meant no more barbecue sauce! 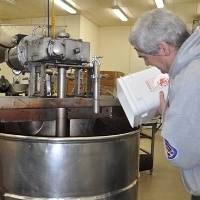 Pouring in the secret ingredient! But she loves BBQ chicken and ribs off the grill, so we took a trip to the store to see if there was a barbecue sauce she could eat. Much to our dismay there were none. That's when I decided to make my own. After a couple of years of tinkering with the recipe, we finally got a sauce with the right consistency and flavor. A thick, sweet & tangy sauce that brushes on nicely and gives a great taste to her favorite meats on the grill. We have been using it at home ever since. 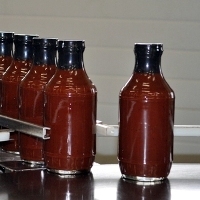 BBQ Sauce coming off the line! Serving it to family and friends over the years, I eventually started getting requests. Apparently it tasted good enough for everyone to enjoy, not just those with a sensitive digestive system. For 10 years now I have been making Hack's BBQ sauce for family and friends and they have been encouraging me to sell it. Now, it's a dream come true...Hack's BBQ Sauce is now commercially bottled and available for everyone to buy! Try a bottle! I am sure you'll enjoy the sweet and tangy flavor of our rich and tasty sauce. Having had a chemistry set as a kid, and getting a master's degree in Chemical Engineering, I have always enjoyed making things in the lab. This type of enjoyment translates easily into the kitchen. I have always found it fun to be in the kitchen. I encouraged kitchen creativity with our children when they were young. Each weekend I would take one of them to the grocery store and let them decide what to make for dinner that night. We would buy the necessary ingredients and then cook the meal, giving Mom the night off. It had to be a balanced meal and include dessert. They pretty much made the decisions on their own with some occasional guidance from me (No, I don't think we should put macaroni in the Jello.) The meals they came up with were very original and sometimes quite tasty! And we loved working in the kitchen together, preparing the meal. When it came time to create a specialty barbecue sauce for my wife, it felt like I was doing another chem lab project. I had better not flunk this one! I tried many different flavors and spices and sauces until finally it all came together. Judging from the feedback, I think this lab got an A+! I am thrilled that so many people like my sauce. Review our testimonials. I hope you will be one of the many who enjoy Hack's, and maybe even write a testimonial of your own!